Here’s a super easy weeknight meal, inspired by this dish from Smitten Kitchen! I’ve spent the past year dabbling in the gluten free world, which lately has sort of gone by the wayside because I decided to run a half marathon in May (yes, really! ), and now that I’m running 4+ times a week, my body doesn’t seem to care whether I eat bread, pasta, or even pizza. It’s pretty awesome, and honestly, worth all the miles I’m putting on my shoes. I made a breakfast sandwich the other day…on an English muffin! After 13 months of corn tortillas and chickpea-flour pancakes, that was pretty revolutionary. Not to say I don’t still love brown rice (and let’s face it, I’d eat a corn tortilla quesadilla for lunch every single day if I weren’t such a stickler for variety), so a ton of meals I cook still happen to be gluten-free, but I can be a little less strict about it these days and still feel healthy and clear-headed. Which is all meant to say, we still have a lot of corn and brown rice pasta in our pantry. Which is why this meal happened. 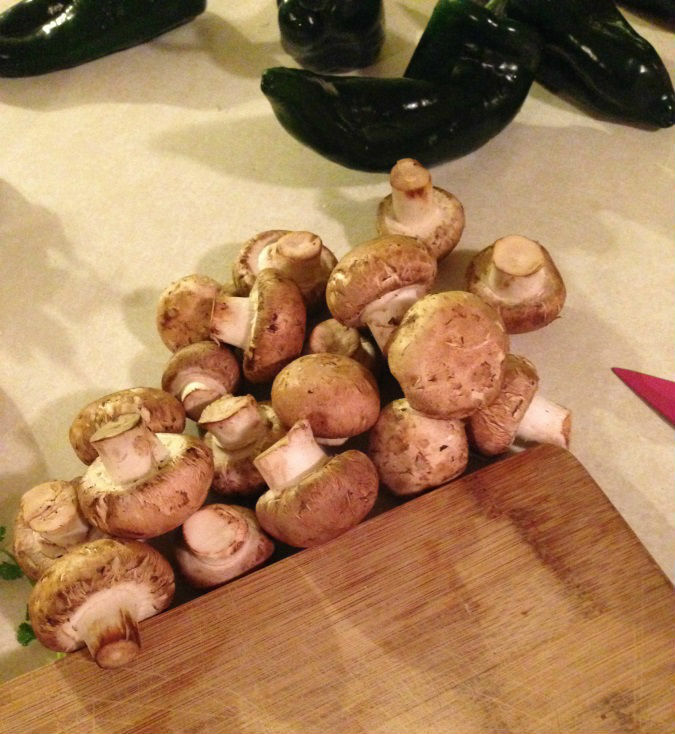 I started by quartering some mushrooms and sauteeing them in my skillet. We made slow cooker collard greens for a dinner party last weekend that used an entire pound of bacon — that fat of which I saved and have been cooking pretty much everything in this week, including these mushrooms. 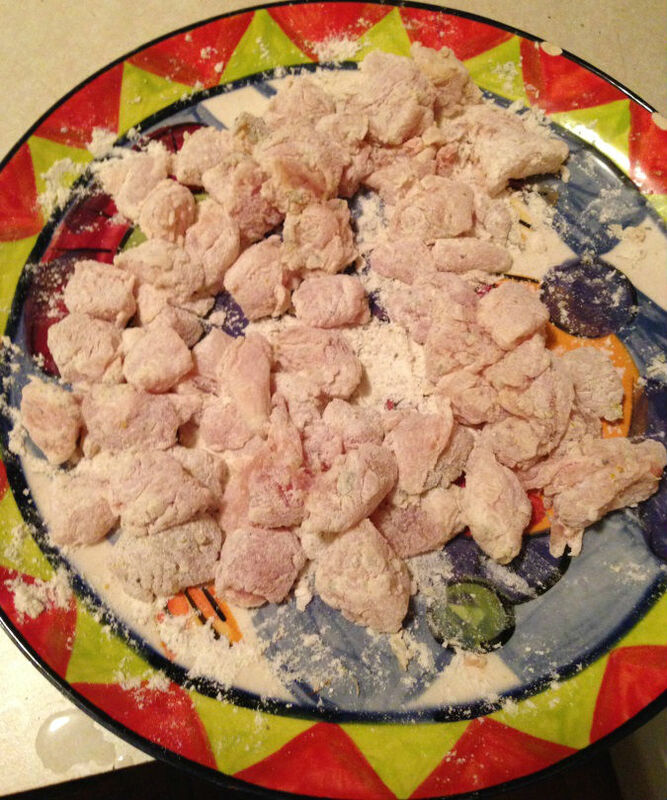 I chopped up some frozen chicken tenders for protein, but wanted a little extra texture to go in there so after defrosting them, I coated them in a simple batter of flour and dried herbs. 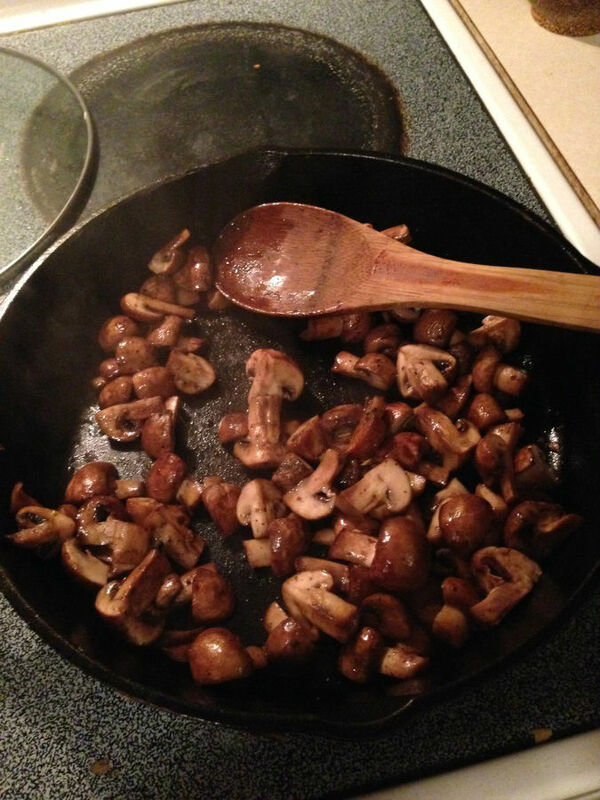 Then I fried them up next in the skillet, and set both them and the mushrooms aside on a plate. Meanwhile, I had been steaming an entire bunch of broccoli in my fancy bamboo steamer (using the pot of pasta-water-to-be as the steaming liquid), which I now removed from the heat (and added the corn pasta to the water to begin cooking it. Corn pasta — at least this brand — takes about twice as long as regular pasta to cook, so get started on it before you think you’ll need to. While all that sauteeing had been going on, I’d chopped up a couple shallots and a few cloves of garlic, which I sauteed in the empty-again skillet for a few minutes before adding the steamed broccoli, some red pepper flakes and salt, and a bit of half and half. This made a nice mushy mess, but looks aren’t important here, because it’s all about to go into the Cuisinart anyway. Here’s where the true improvising begins. 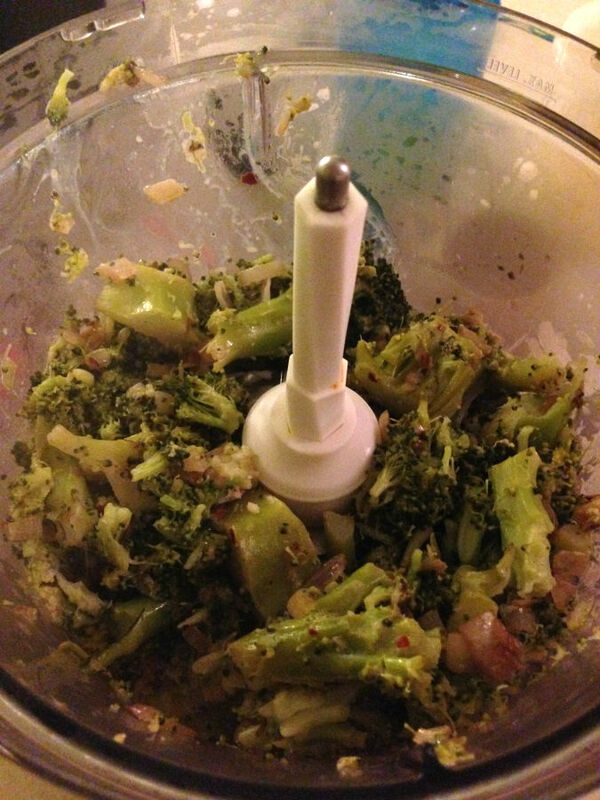 After a few pulses in the Cuisinart, it looked like super thick cream of broccoli soup, but then I started adding odds and ends from the fridge to make it creamier — some random soft cheese wedges that were left over from said dinner party, a little more cream, spices and salt to taste, and then to thin it out and turn it into more of a sauce, I took a dips into the pasta water with a measuring cup (though I can’t tell you at all how much!). Regular water probably would have worked fine here, but pasta cooking water gets nice and starchy, especially from corn pasta, so this helped to give the sauce some body. 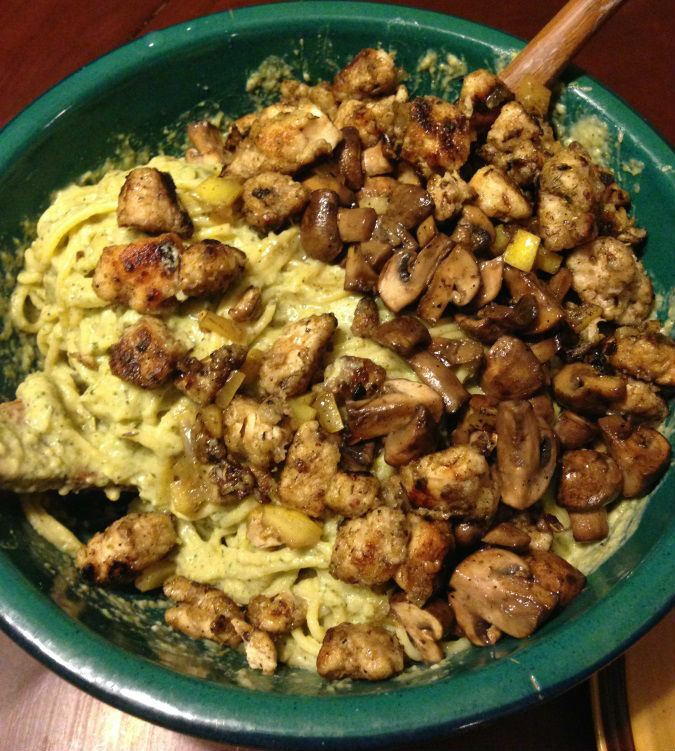 Once I was satisfied with the taste and consistency, I drained the pasta, mixed in the sauce, and then topped it with the mushrooms and chicken. 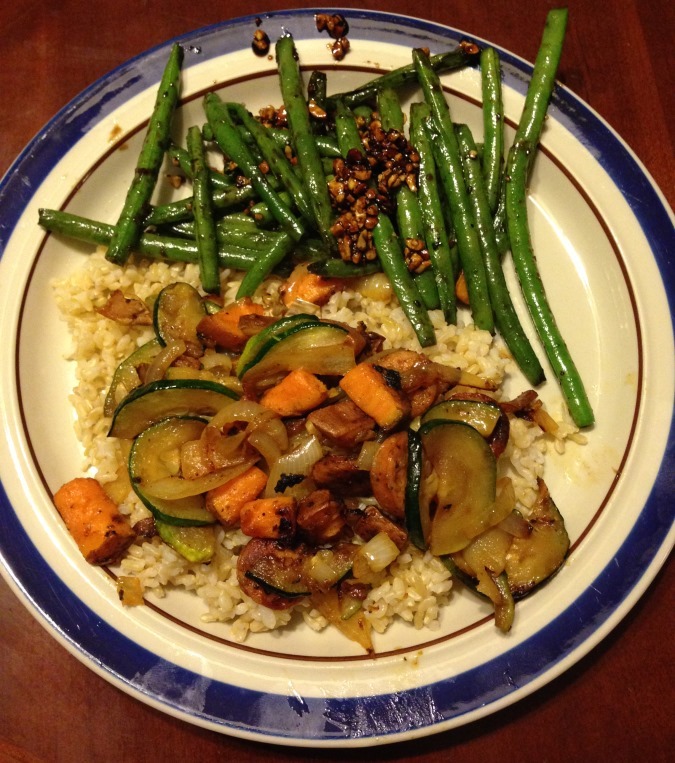 Easy and healthy (minus the bacon fat) one-dish meal!